Why is a Day Care Interview Important for a Parent? One of the biggest stress that comes to the mind of any working parents is about their children. Their demanding work schedules and responsibilities as a parent have to be balanced. There will be constant thoughts of ensuring the safety of your child in stages like this, where you can’t manage to be with them. Day care comes to the rescue in cases of working parents. 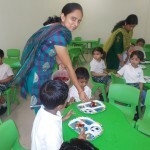 Day care is a place where the child spends a few hours under the supervision of a teacher/supervisor. BETTER UNDERSTANDING: There should be a proper understanding between the parties, the supervisor as well as the parents. Nobody can understand a child’s requirements as best as his/her parents. 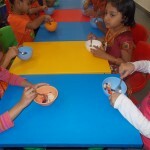 After ensuring the overall facilities of the day care, if found suitable, the day care can be opted for the child. The needs of the parents can be enquired to provide maximum support, care and comfort to the child at the day care. SPECIAL NEEDS OF YOUR CHILD: If there is any health issues, food allergies or special diet to be followed by the child, mention it in detail to the supervisor in charge. This enables to take care of the child’s requirements properly. Also, get an emergency contact number to contact the parents in case of emergencies. SIGN A CONTRACT: While choosing Day Cares, it is necessary to understand if it’s a professional or certified day care. For professional day cares, it will be best if there is a contract signed by the parent. The provider can explain the terms of the contract to the parents so that they are aware on all the terms binding upon signing the contract along with the facilities provided by the day care. This will help to avoid the risk of any misunderstanding in the service offered in future. By developing a better relation with the families there will be an increasing number of parents preferring your day care facilities as each of them give priority to the comfort and safety of their children. V Kids always focus on the importance of extracurricular activities, to tap the full potential of the children. The good learning experience and creative contests in childhood helps children to be creative leaders in future. VKIDS organized the RED DAY on 18 September 2013 and the theme and concept of the program was to come in red coloured dresses and to decorate the hall reserved for the event in red colour. VKIDS celebrated the day with children and teachers coming in red coloured outfits. The playing room is decorated with red dominating toys, balloons, tables and other objects. Some of the parents also participated in the program with a lot of excitement. 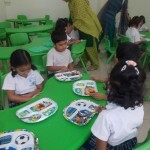 We received a very positive feedback for the program and parents informed us that they expect more of such activities in our pre primary school. Children opined that it was great fun to participate in the program. Field trips are always a fine way to broaden the minds of the students and it helps to provide them more knowledge in different fields .On 13th September our tiny little stars of nursery were taken to helipad as a part of field trip. Children got excited as they could see the helicopter from such a close distance. They were also shown the interior of a helicopter. It is everyone’s childhood wish to fly and helicopter and aero planes are the inventions that made that dream a possibility. To see a helicopter from such a tender age really inspires them to aspire for a career in it, in psychological sense. Children had great time watching the helicopters and the place and opined that it was great learning experience for them.